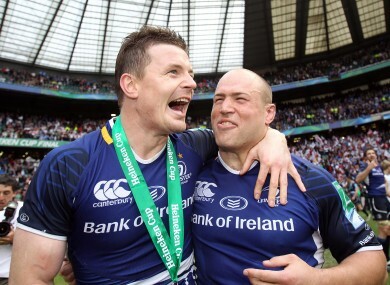 Brian O'Driscoll and Richardt Strauss celebrate winning the Heineken Cup in May at Twickenham. THE STAR-STRUCK BENETTON TREVISO defence has a lot to answer for. It took a typical Brian O’Driscoll spark of genius to turn a valedictory season into plans to loan out the Irish captain to the British & Irish Lions as long as we got him back in one piece for an assault on the 2015 World Cup. Never mind the fact that the O’Driscoll is nearing his 34th birthday, contributing to a post-retirement biography and declaring that he is not looking beyond Christmas, let alone next May, before making any calls on his playing future. One pick-and-go burst through the Treviso defence and O’Driscoll was the man. He did little to ease the hysteria with a superb try against Munster last Saturday. Inevitably, with Joe Schmidt signing on until summer 2014, talk turns to O’Driscoll keeping him company a while longer. With 30 fixtures, including some wishful Leinster thinking, remaining on the calendar, the Dubliner has plenty to keep his mind occupied. With Exeter Chiefs, Llanelli Scarlets and Clermont Auvergne considered by many to be steep steps, but steps nonetheless, on the ladder, talk has turned to Leinster making it three-in-a-row at the Aviva Stadium next May. Obviously we had a home semi-final against Perpignan. I remember going off with around 20 minutes to go with a torn hamstring. We weren’t going well at any stage in the game but it was difficult watching the last 20 minutes as the lead slipped away. Six years later the pain receded, and further Heineken Cup wins in 2011 and 2012 definitely helped, but it has not diminished O’Driscoll’s ‘incredible’ desire to win the cup in Dublin. “Since we won in ’09 it’s not a case of starting out trying to retain it, it’s a case of trying to win it again,” he commented. Exeter arrive at the RDS tomorrow, in the words of winger Ian Whitten, looking to give Leinster a real rattle. O’Driscoll is aware of the Premiership wins that the Chiefs have recorded so far this season and believes, without having the best chances of knockout qualification, they are capable of causing some shocks. The reigning champions trained hard for their encounter with Munster but further injury blows have led to less than perfect preparations ahead of Saturday’s clash. The five minutes you might do in a week has to be up to high intensity. Get the quality done and then you have to park that for the weekend. Brian O’Driscoll with the Ultimate Rugby App at the Aviva Stadium. For every stunning try in the back catalogue, and there are many, there have been examples of O’Driscoll putting his body on the line for the cause and the calling – witness the hit on Danie Roussow for the Lions in 2009. All Black captain Richie McCaw, just a week into his six-month rugby sabbatical, revealed that he had masked injuries to compete for club and country at crucial moments in the past decade. O’Driscoll nods his head when TheScore.ie proposes that it is hardly the revelation of the year. Some players react differently to (injuries). Some guys like to play when they are near 100% fit and won’t play if they’re not. A lot of guys never play 100% fit. Yeah, you can tell, it tends to be the very mentality tough guys that are able to. I can see it in the guys in the squads that I’ve been involved in. Guys that are capable of playing through serious discomfort. “Sometimes it is about striking the balance,” he adds. “If you’re 80% fit but you feel as though you’re doing a better job than someone else who is 100% fit, then you have to make that call for the team’s sake, not just your own selfish point of view – wanting to be involved in a game. With shoulder stingers a niggle of the past, O’Driscoll is back lifting weights, challenging all-comers at Leinster to table tennis matches and ‘living vicariously’ through the younger squad members. He knows that his playing career will wind down soon and he trusts those around him, and his own judgement, to know the season that is one too many. With Paul Kimmage lined up to assist with the impending autobiography, are there good stories O’Driscoll may be holding back? “There might be one or two things,” he replies with a grin. *Brian O’Driscoll was speaking at the launch of Ultimate Rugby App. – a one-stop-shop for players and fans covering 3,000 Northern and Southern Hemisphere matches each season and available from iTunes or www.UltimateRugby.com. Email “Brian O'Driscoll: You have to feel those disappointments to appreciate it fully when it comes around”. Feedback on “Brian O'Driscoll: You have to feel those disappointments to appreciate it fully when it comes around”.